Thank you for all the kind comments on my last post about the Modern Bee book! This year has been so full of exciting changes and the last few weeks have been no different. My husband and I made the move to Nashville, Tennessee earlier this year, and we just moved again to a new house on Labor Day weekend. One of the reasons was to make room for our new addition. If you follow me on Instagram, you might have seen my announcement a few weeks back that we're having a boy! My mom came to visit last weekend from Ohio, and she and I had too much fun putting together this nursery. And I couldn't have done any of it without her help! She painted the walls, refinished the dresser, and helped me put up artwork around the room. 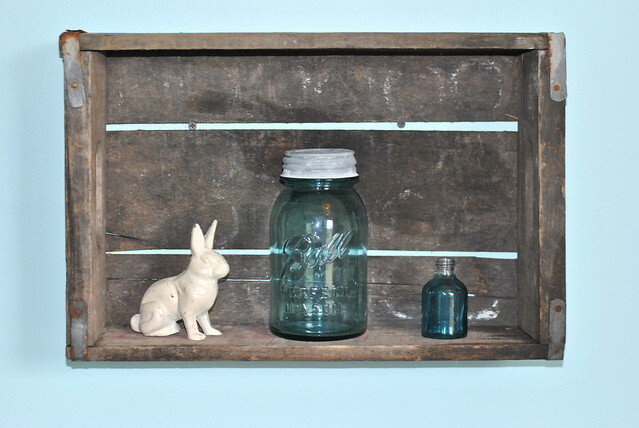 A favorite piece is this antique wooden Pepsi crate made into a shelf. I've been jonesing for some blue-glass jars for a little while, and the cute cast-iron, antique bunny perfectly matches the . . .
. . . Wall decals! I ordered these cute wildlife wall stickers from Designs by Delia, and she was so kind to rush ship them to me so they'd get here in time before my mom had to leave. It was my first time doing anything like this, but they went on super easy and they can be easily removed later on. 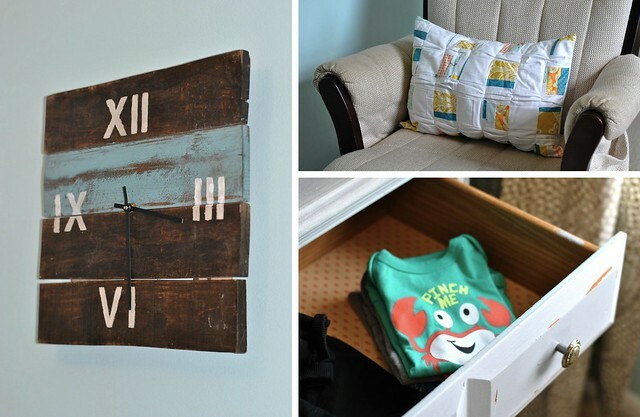 This rustic clock was an antique mall find, and the Pleated Boxes Pillow is from the Sew Along I hosted on Craft Buds last year. Of course, once you have some cute dresser drawers, you need to shop the Target clearance racks to find something to put in them. Thanks, mom! I'm so thankful that my friend Veronica gave us this beautiful crib (not as difficult to assemble as I once imagined), and the super-comfy glider was another gift from our new neighbors! I've heard these will come in very handy. :) The dresser and nightstand were lucky flea market finds. Here's a wide shot of the opposite side of the nursery. The window gives a lot of natural light, which makes me think this will make a great room for photographing sewing projects. Thanks so much for taking a look! 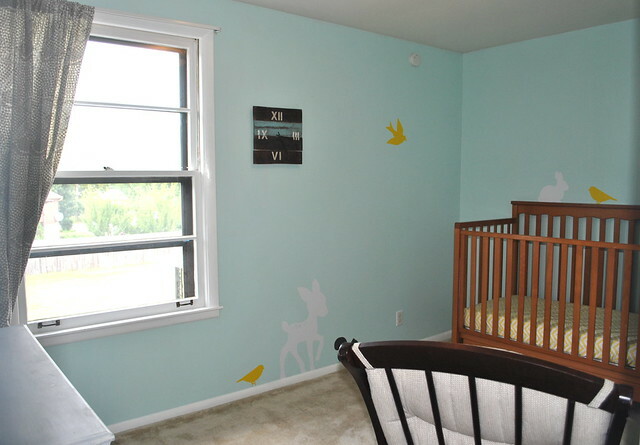 With the nursery ready, the next step is choosing a name. 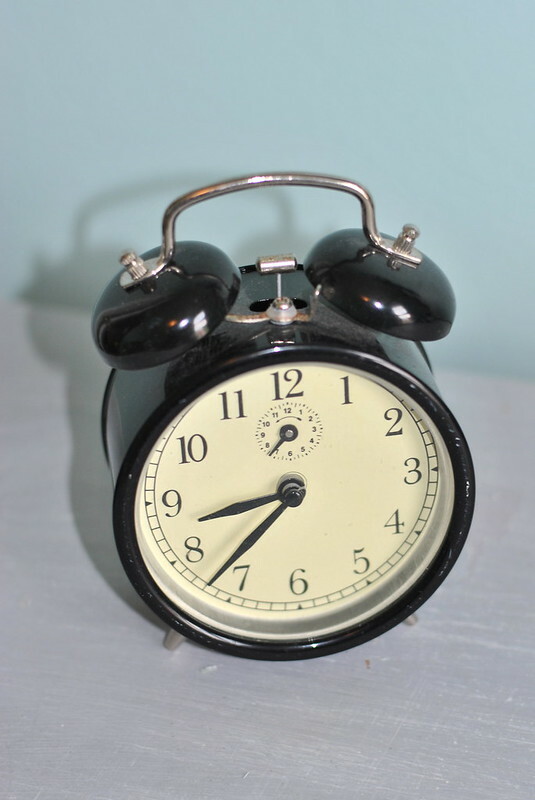 Although we've got plenty of time until January, it's proving to be a pretty serious task. 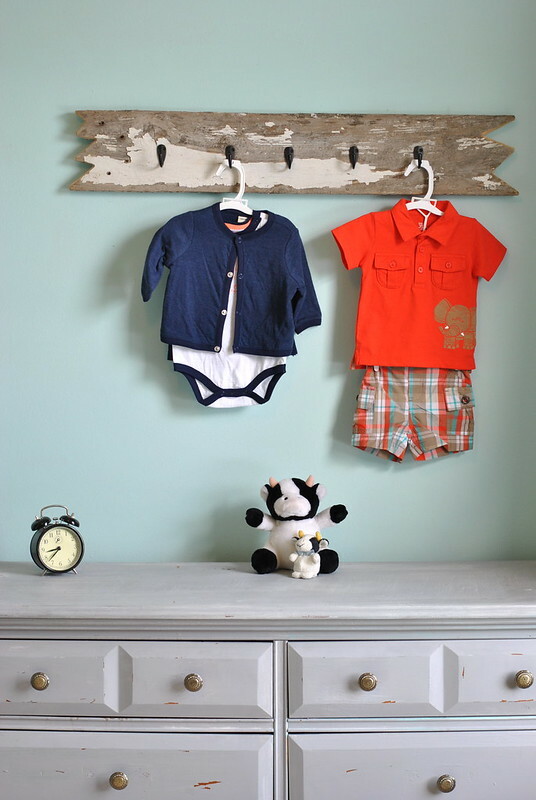 What are some of your favorite baby boy names recently? A friend of mine named her new baby boy Cedar...I really like that. Wow! Can your mom come visit me? My house needs a lot of decorating help (as you well know)! 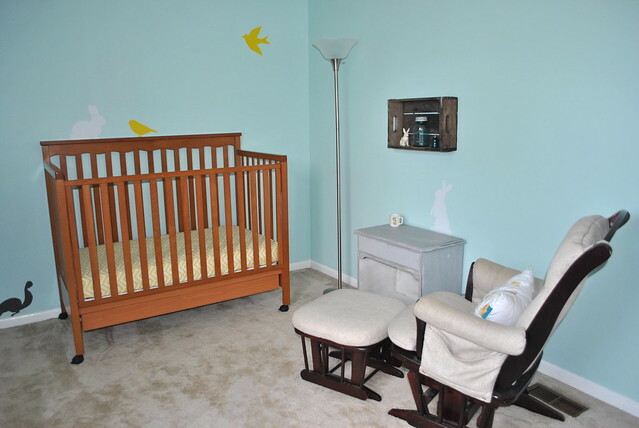 What a beautiful room, and so glad you could use the crib! Congratulations! Little boys are so much fun! I loved picking out the names for our kids. My only advice to you for you and your husband to decide on a name just the two of you, and then keep quiet about it until the little guy is born. I found out the hard way that EVERYBODY has and opinion and that it is best to simply announce the name when it is a done deal. Everybody will love him no matter which name you choose! Just heard the name Rohan, pronounced Rowen, and thought that was such a nice sounding name. Congratulations and what a beautiful room for him to come home to! My pick for a name would be Adam, I've always loved that name and both of my girls were Adam until they were born... ha ha now they are Ashley & Savannah. My oldest lives in Nashville and loves it. I've already met one wonderful quilty friend in Nashville, maybe we could meet next time I'm up! I'm so impressed with your projects. Even though I don't sew very well, I find them inspiring to do something crafty. My current favorite name for a boy or girl is Hollis. Best of luck in the remainder of your pregnancy and delivery! Take care! My favorite boy name is Kevin Michael! Congrats! I agree with Katy - spelling and pronunciation are way important in choosing a child's name. You could have probably guessed this about me, but I used a spreadsheet to figure out my son's name. I used a baby name book and added the names I liked, then I checked the popularity of them, then paired them with the middle name I wanted to use to see what the initials would be, and after that, it was all about my gut. The other thing I checked was what kind of nicknames could be made from the name - since I have a nickname from my name that I hate! As for some favorite names lately, I do like Landon and Ethan, and I also really like Oliver. It just seems so sweet to me :) Good luck! I agree with Elizabeth -- it's worth doing a little research. With all three of my girls I took time to check the meanings of their names. That was important to me because I wanted to be able to let them know about it when they were older, that we chose meanings that held a little of our hope for their lives. My oldest daughter, for instance, has a name that means "bringer of light" -- such a great thing when we want to tell her how she's brought so much joy and light to our lives and how important it is to continue to do that for the people around her. Just keep in mind that EVERYONE is going to have an opinion about the names you pick, but it's YOUR kid so YOU get to choose. As long as you can picture yourself happily saying it on a daily basis in the decades to come and you don't think your son is going to be embarrassed to have to write it on his first job application, I think you're pretty good to go. Congratulations! 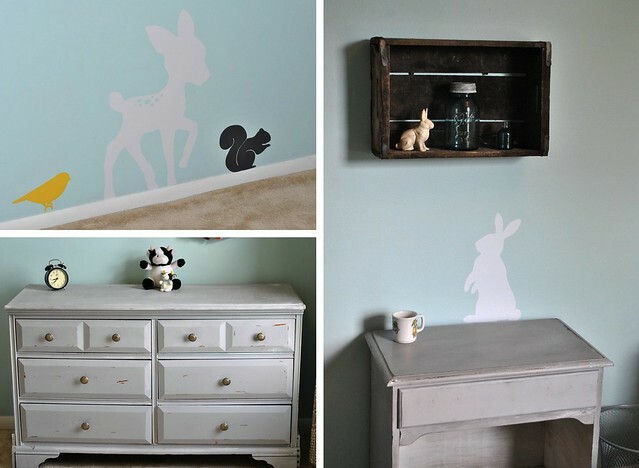 I want that little bunny decal for my own room. Sooo cute. I like the little elephant outfit too. For some reason, baby boys in plaid drive me crazy in the best way possible. I love strong, classic names for boys. We used our grandfathers' names for my youngest son and I just love his name; James Major. We both had a grandfather named James, I had one named Major and the 4th grandfather contributed the last name!